Transportation in Punta Cana via buses is fun, frustrating, a great lesson in Dominican culture and the most economical way to travel. 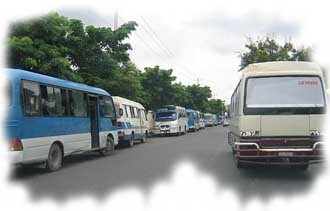 The local buses called guaguas are the cheapest form of travel in the country and a great way to meet the locals. In fact, a one way trip to Higuey will only cost you around one dollar. We paid $6 for a trip to Santo Domingo once. Guaguas are a lot of fun, but if you aren’t a very hardened traveler they can be a little shocking. They’re rammed full of friendly people who will be smiling and asking you questions – offering to show you around. If this doesn’t sound like a good time to you, guaguas aren’t for you. They can also be somewhat difficult to use because guaguas don’t seem to stick to a set schedule – just stand at the stop and flag one down as it goes by. There are also a couple different city bus companies that offer transportation in Punta Cana and transfers between Punta Cana and major cities. They tend to be super cheap, if you can figure out their stops and schedules – you can get an air conditioned bus ride for about one tenth of what you’d pay for a taxi. Caribe Tours is one of these companies and has nice new buses. Their phone number is 809-221-4422, they also have a website at http://caribetours.com.do . We didn’t bother making a link to the site because it’s all in Spanish, we’ll hopefully get an English schedule from them soon. There are two types of taxis in Punta Cana: tourist taxis and city taxis. A few years ago, the government decided to spend some money by investing in a new transportation system for the ever-growing tourist trade. These new(ish) taxis are all sand colored and are definitely the most reliable vehicles on the road. However, they do charge about double what the city taxis charge in their somewhat older cars. Wherever you go, you’re likely to see tourist cabbies and city cabbies screaming and hollering at each other for tourist’s business. Another thing that North Americans find shocking is that taxis often stop to pick up other locals along the way, if this bothers you just tell your driver. Shop around and make sure you set a price before you leave! The most common cab ride is from the Punta Cana airport to your resort – don’t pay more than $20 each way. Renting a car in Punta Cana is way more expensive than renting one at home so unless you plan to be doing quite a bit of traveling, taxis will be cheaper. Also, unless you’re into extreme sports, driving in Punta Cana isn’t a great idea. Speed limits are posted, but not respected – driving is on the right but drivers tend to pass on both sides. This is like the wild west of driving. If you do decide to hire a car in Punta Cana there are some things you should know. Your “gold card” credit card insurance does not cover you if you drive on an unpaved road – fine print that becomes very important when you break down on a dirt road in Punta Cana. Traffic accidents are taken very seriously here, if you have any trouble call your embassy and have them get you a lawyer. We’ve also heard reports of police stopping cars driven by tourists and demanding money for some ludicrous traffic violation – if this happens to you the best thing you can do is just pay them. While this all sounds very daunting, if you do get used to driving in Punta Cana you might get accepted on the stock car circuit next year. All this being said, renting a car is our favorite method of transportation in Punta Cana. The easiest way to get from Santo Domingo to Punta Cana is the shuttle flight offered by Air Santo Domingo, the flights leave daily and will run you $65 each way. Air Santo Domingo’s telephone number is 809-261-5222. If you are going somewhere along the beach call first and ask if they can send a water taxi to pick you up. Whenever we go to the Jellyfish restaurant in Punta Cana, we ask them to send a boat for us. Water taxi is a neat way to travel and you’ll get a great view of the entire beach. The public bus system is cheap and a lot of fun, but if you’re not ready for the culture shock don’t try the gua-guas. If you are, this method of transportation in Punta Cana is the best way to feel like a Dominican for a while. There is a reason why backpackers tend to have an easy time moving around almost anywhere – they don’t look like they have anything to steal. Don’t flash your money around. If you rent a car in Punta Cana, I suggest you stick to one of the major rental agencies: Avis 809-535-7191, Budget 809-549-0351, Hertz 809-221-5333. Make sure you set prices with cab drivers before getting in. Tourist taxis cost twice as much as regular cabs. Unfortunately they are often the only cabs at the hotels. If you take a city cab from the airport – keep his name and number in case you want to use him for an excursion. If you do go on one of the tour buses (like Caribetours) they max out the air conditioner so bring a sweater. If you find a taxi driver you like, hold on to him and use him for all your trips. Most taxi drivers will also serve as tour guides if you ask them.